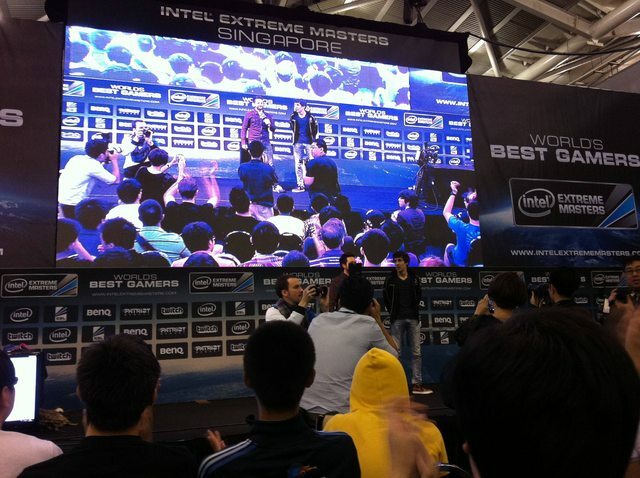 Caution: IEM Singapore spoilers contained in this post! Title is too long to put the warning there! Singapore for once felt so foreign to me. 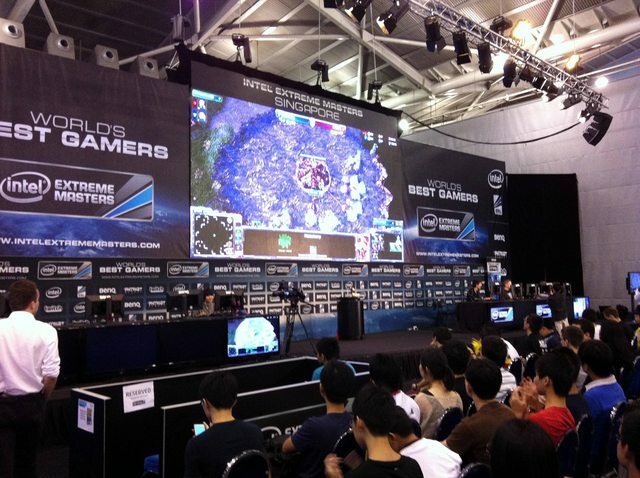 Never have I attended a StarCraft event live, and so happen that IEM came to Singapore. I knew this was the perfect chance for me to experience what does it feel like to sit in the crowd and cheer amongst them. Although I could only attend the second half of Day 4 (Sting vs VortiX onwards), I would say that IEM Singapore did not disappoint. The welcome I get when I first enter. It was really sad when Sting won over VortiX, especially when VortiX's best match-up is ZvT. What you don't get to see when you're behind your computer screen is the brotherly love he shares with LucifroN. VortiX was about to tear, while LucifroN was there just comforting him and going through the games with him after a bitter loss. Another of our foreign hope was gone, and Sting advances to the finals over VortiX. Sting being interviewed by Jarett after advancing over VortiX. It's a guaranteed foreigner-in-finals as Grubby and sLivko fights for the last spot in the finals. Everyone's excited over this match, and the crowd is defiintely on the side of Grubby's. 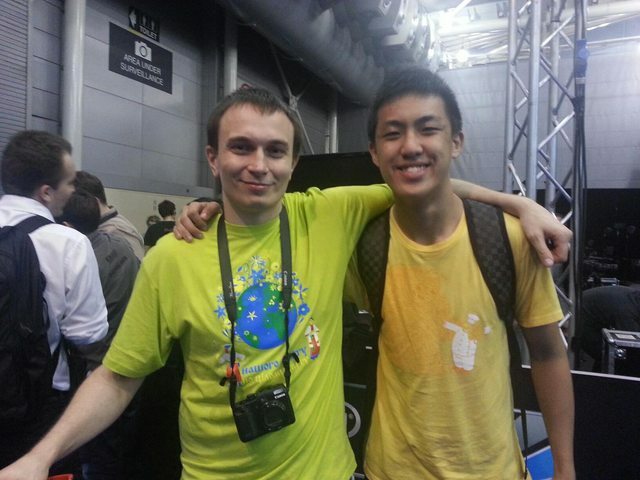 sLivko's still looking strong as he won all his PvZ in group stages, losing only to LucifroN. Grubby and sLivko having their pre-match interview. Minutes after minutes, we saw Grubby's army of zealots, immortals and sentries get ripped apart by infestors. "Oh! "s went flying everywhere, and we were all very discouraged when Grubby reached an all-or-nothing point at 0-2. At this point of time, there was something happening that you viewers at home wouldn't have seen. 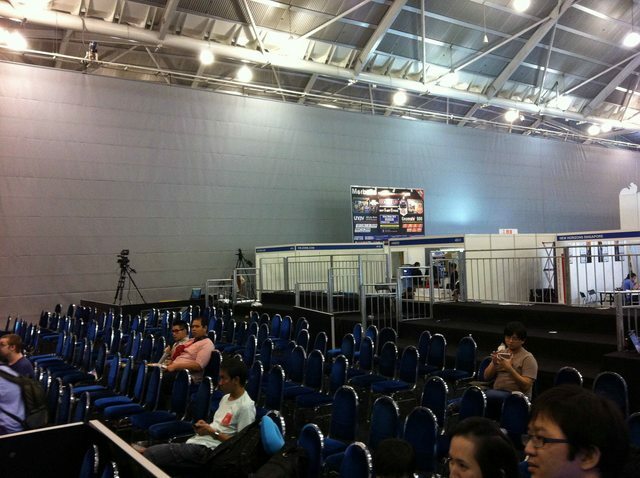 It's quite a funny sight to me, as Sting was watching recordings of IEM Singapore on their twitch.tv channel. He was looking at sLivko's ZvT matches (only against LucifroN), as if sLivko was gonna advance already. 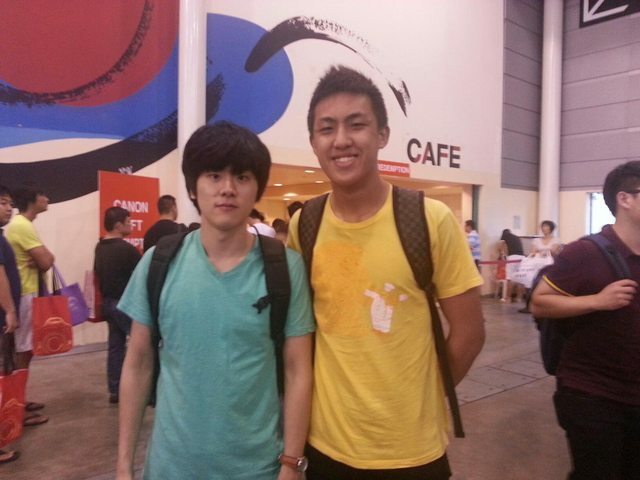 He kept studying and studying sLivko, while Grubby entered his Bankai mode and took the series in fashion to 2-2. The crowd, though small, was just roaring already as the countdown started for the final set. Now, Sting, looking at the main screen just behind him, realized that Grubby could advance over sLivko. Now you start seeing him watching Grubby's PvT (he googled "grubby pvt") and studying him. I really wished that Grubby would win sLivko and teach Sting a lesson at this point. After the epic 5th set, Grubby was on cloud nine, and so were we as supporters and crowd. 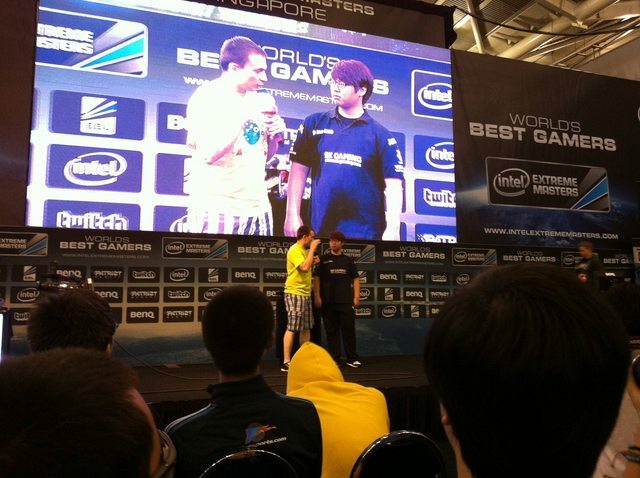 Grubby being interviewed after winning, having a taste of the gold already. I didn't know they would not go straight to the finals, instead they decided to play an FFA featuring Kaelaris, Jarett, HasuObs, and 5 other Koreans (MC, MC's manager, Zenio, Oz and KingKong). Amazingly, first place walks away with an i7 chip! Not only that, the progamers are gonna off-race as Random! MC staring at Carmac, wondering if he's holding a hamburger. Interesting match, as the Koreans teamed up against the non-Koreans. First was Kaelaris (because he talked about MC's mother), then HasuObs (somehow, MC is just boss at targeting others) and lastly Jarett fell because of reis's all-powerful mass Void Rays. reis is just too good at hiding his Stargate Tech. 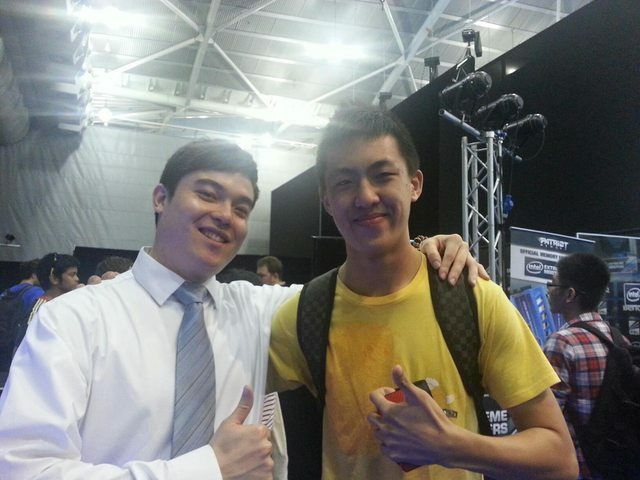 The finals was just a very nice series to watch, with Sting going 2-0 against Grubby first. 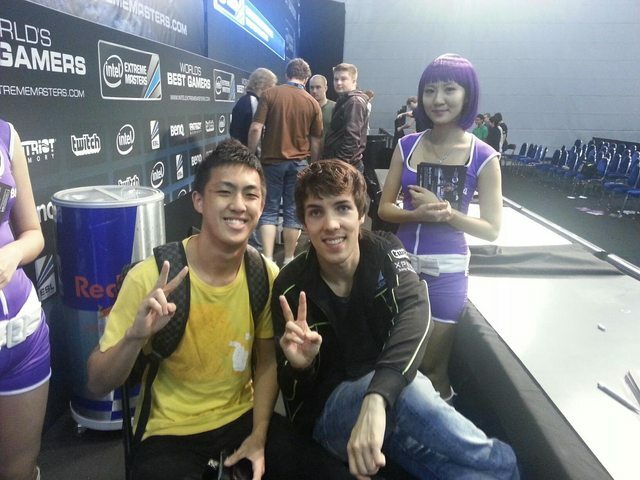 Everyone was just supporting Grubby. It's pretty obvious when the applause Grubby gets is much louder than Sting's. We thought Grubby could go 3 games in a row again, just like he did against sLivko. The first two matches he won was just too good, with a lot of back and forth exchanging going on, we were just kept at the edge of our chairs. However, at the last game, Grubby just fell after a semi-failed pressure to Sting's very delayed 1-1-1. Sorry, no photos of the final moments because I was just too engrossed in hoping Grubby could pull a comeback somehow. No photos of prize presentation as well because me and my friend decided to leave after the last game (but we ended up taking photos with prominent figures). How the spectator place looked like after the event. For a first time at a live event, I've learnt that there are many things (pros and cons) that you wouldn't experience compared to when you're at home. 1. I would consider this as a con. At random times, when you least expect it, there would be a banner / cheerful suddenly raised up in your face. You just wouldn't be able to see what's in front of you, what's on your screen, and worst of all, what's on the cheerful because it's faced away from you. You would feel pissed that they're blocking your view and you would just want them to scram. Here's the couple sitting in front of me, who were raising cheerfuls. Me, behind in the yellow, not so pissed off after all. 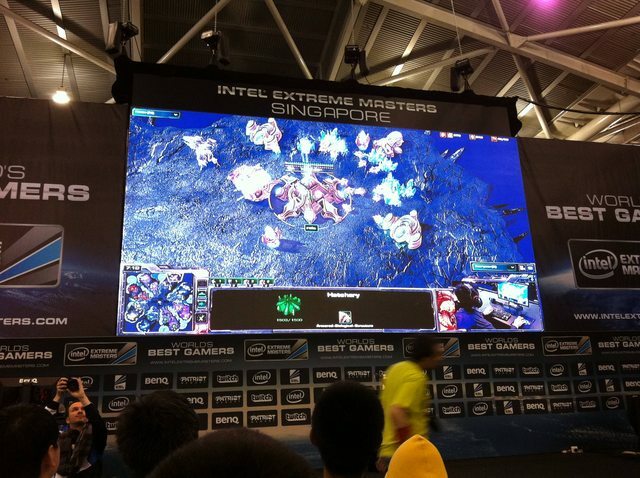 Image courtesy of IEM's twitter account. Kidding about the pissed off part of course. It gets on your skin sometimes depending on what kind of person you are (well, I'm kinda impatient). I take my hat off to the couple, firstly because they're a loving couple who loves games. Secondly, making cheerful is something that Singaporeans have no experience in, because we don't have live events here. Unless, they've been to Korea and watched GSL and made cheerfuls there. 2. This could just be a personal opinion. Initially, before I went to the venue, I was thinking to myself that I wouldn't be like those extremely high fans who go "Whooooo!" and stuff when the casters tell you to cheer for the players, or clap my hands when something great like destructible rocks fall. I adopted a conservative mindset, that I would just be there to sit and analyse the game and watch it as if I'm at home. When I reach there, I took a seat, watched the first few games and just set there and thought to myself "Good games, good games." However, maybe I was influenced by the people, I suddenly found myself clapping and cheering loudly for favourite folks like Grubby. Here's what I gathered at the end of the day. If you wanna go to an event and just sit there and analyse the game, why not just stay at home and watch the stream? It's more comfortable there, you don't have to squeeze with a multitude of people just to get to the venue. You could free up one seat for another guy who really wants to be there and cheering for his favourite players. If you go to the event, be sure that you cheer your heart out, because that's what spectators and nerds of e-sports do. 3. This is definitely a pro, and I didn't realize this until like when it actually happened to me. When I first took a seat, Sting and VortiX was going on. It didn't hit me that I'm seeing actual progamers with my own eyes until a while later. I went, "Oh my, I'm actually seeing VortiX and LucifroN real life!" I even walked past LucifroN on my way to my empty seat, while he was watching VortiX play. Soon, I started taking photos with them, and wow, I could actually feel Artosis physically (no homo, really) as we side-hugged and took a photo. It was also really great that the people (actually just the Westerners) were really sociable, very different from our conservative Asian culture. They could hold a conversation much better than our whole population combined in Singapore. Nah, just kidding! 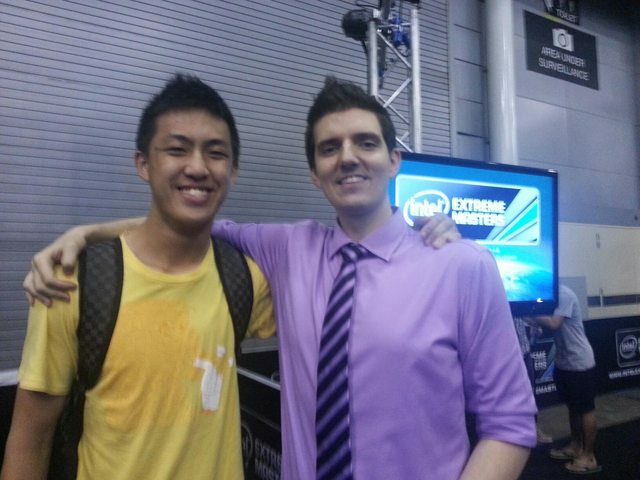 I didn't knew Artosis was so tall (he's about 1.83m, just about as tall as me), and when I told him that, he said to me something like "We're all tall nerds!". Best. Experience. Ever. With. E-sports. At the end of the day, I was a very happy nerd, as my final photo request was with Grubby, and I walked away with a pre-printed card of Grubby. 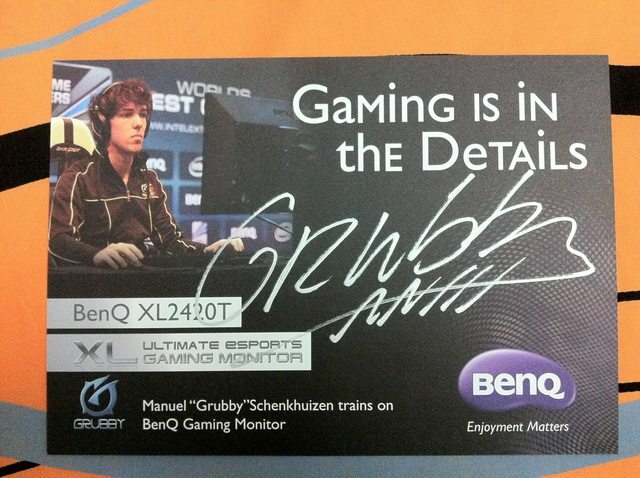 Grubby autographed it on the spot. 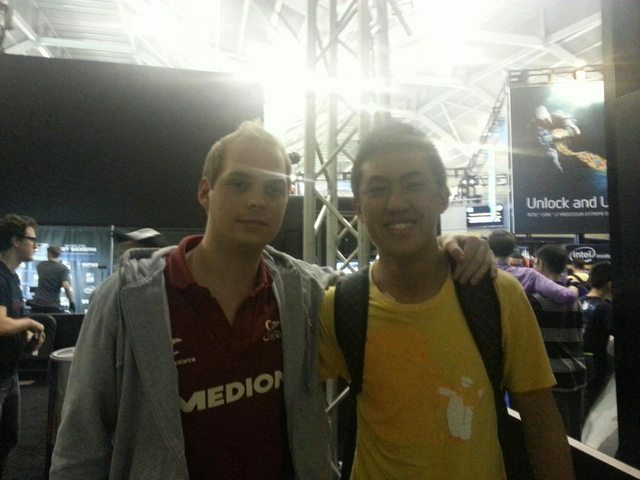 Who would know I would one day get a progamer's autograph? Oz is kinda awkward in real life. MC with his cool turtle bag, and I tried to copy his smile. I actually went backstage for this photo with HasuObs, and parkoured over the barriers. Jorosar gotta get some love from Singapore too! If you look closely, Carmac's holding a walking stick. He has a football injury. 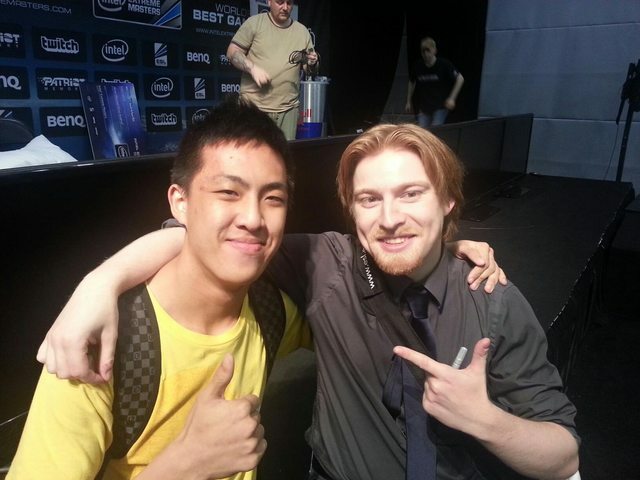 I thought Kaelaris was doing a thumbs up... oh well. Grubby and the famous BenQ girls supporting Jarett. As a final note, I really wish more major events would come to Singapore, simply because Singapore's a good place to host such events, apart from the fact that Singapore is a very hot place, just like what Sting said in one of his interviews. I think Kaelaris mentioned that Singapore is a lovely place to hold more events too.. Just a down side is that there isn't much live viewers, so sponsors and such wouldn't really benefit right off the event. Other than that, Singapore isn't a run-down country that most people would think it is, and I think the organisation is decent enough to support major events. 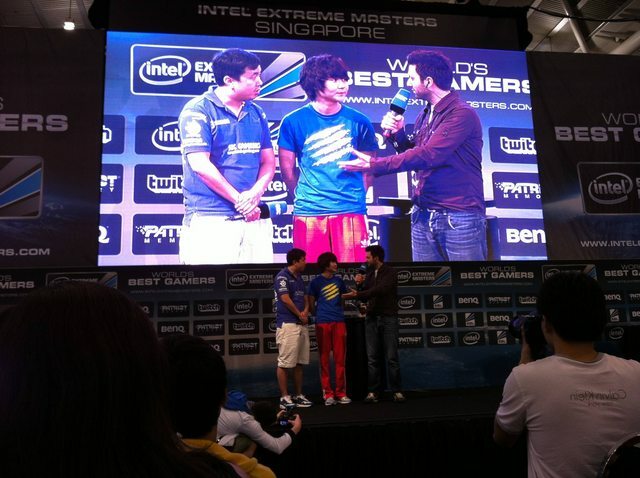 Hope you all enjoyed this snippet of IEM Singapore. Cheers! 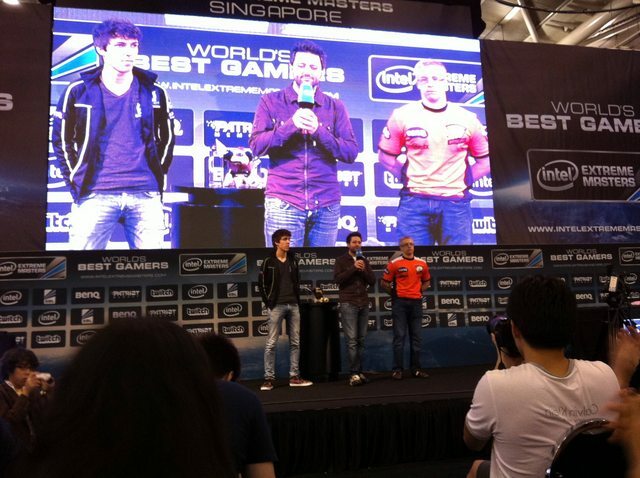 Progamers who chose to attend this instead of Dreamhack - Welcome to Singapore! I was there for all 4 days and i must say the crowd was soooo much bigger than i have expected. 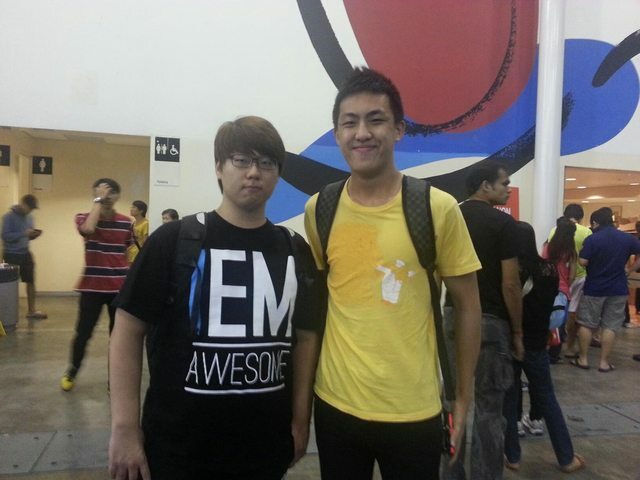 Was a very interesting and fun experience and i hope another event will be held here in Singapore! As for the organization... well, I have my critiques, but I directed them where they needed to go and it does me no good to bring them up here.